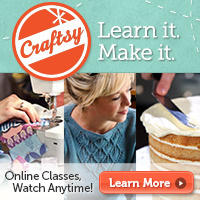 ← Crochet a cute lil sloth with me at Creativebug.com! 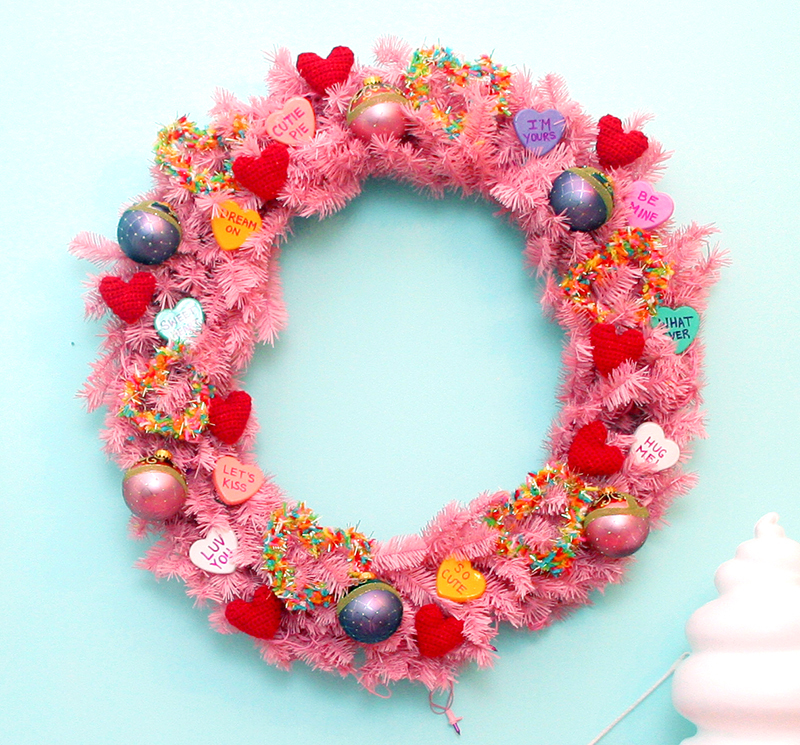 There’s a craft party in my Valentine’s Day wreath – and you’re invited! I am a huge fan of Valentine’s Day decor. If every article of my clothing could have conversation hearts all over it, I would be a happy gal. 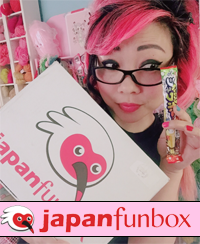 I was super excited when Treetopia asked if I wanted to join their #xoTreetopia Valentine’s Day Blog Hop and Giveaway. On Monday the blog hop started with Jennifer Perkins, then Tuesday with Jaderbomb (looks like we both did glue gun hearts with different materials! ), then Wednesday with Cathie Filian, then ME today, and then Flamingo Toes on Friday! 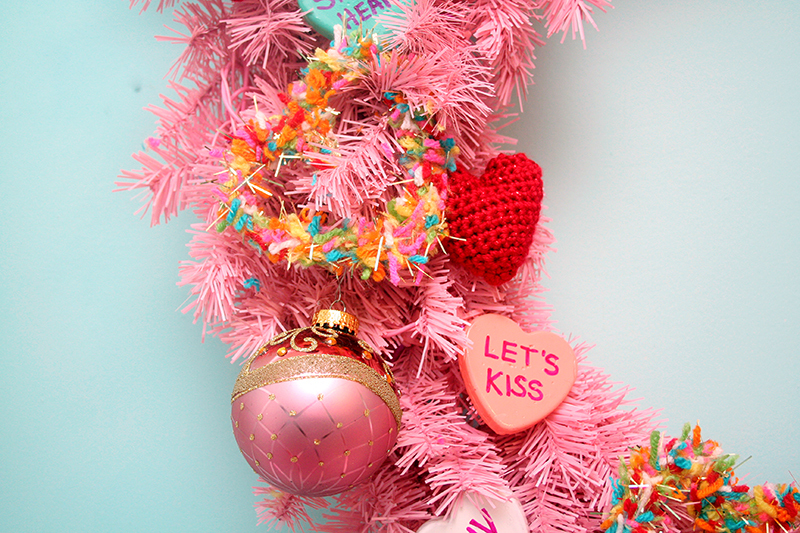 Visit everyone to check out their super cool Valentine’s Day decoration ideas and don’t forget to enter the giveaway to win some Treetopia decorations of your own. You can also hop over to the Treetopia blog to check out some Q&A’s with all of us regarding the importance of the little things in decorating and the little things in relationships. Here’s mine! 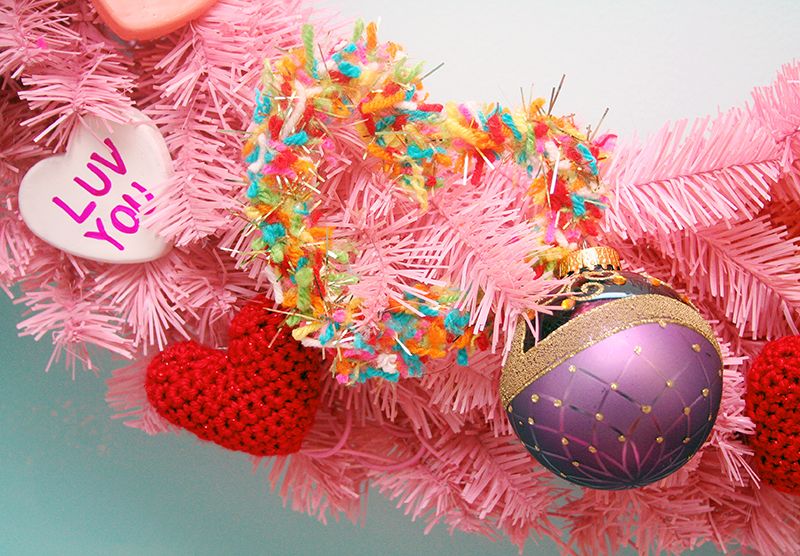 Treetopia sent me the Pretty in Pink Wreath and the Milady Pink and Plum Glass Ornaments. This wreath IS ENORMOUS!!! AND IT LIGHTS UP. At first, I wondered if I was a wreath-person and where I would put a wreath of this size. I feel like the mind wants to put a wreath on the front door or somewhere in the entryway or at the very least the living room. 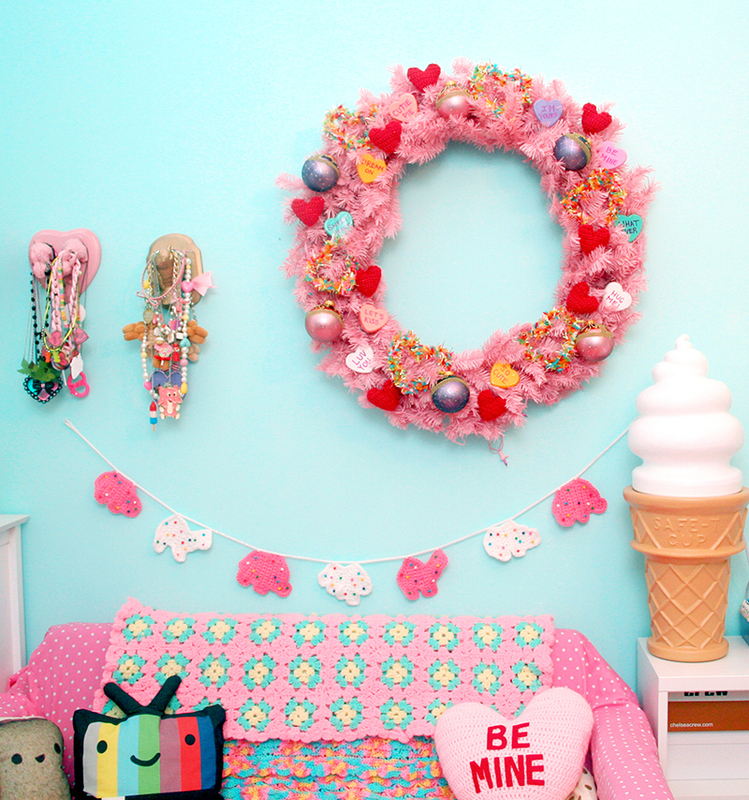 BUT, I decided….. it would go perfectly in my bedroom, which is already kind of an explosion of pastels and sweet things. I also took the opportunity to try out some tutorials from other crafters. I used the hot glue gun hearts tutorial from DIY Conversation Heart Rings by StudioDIY. 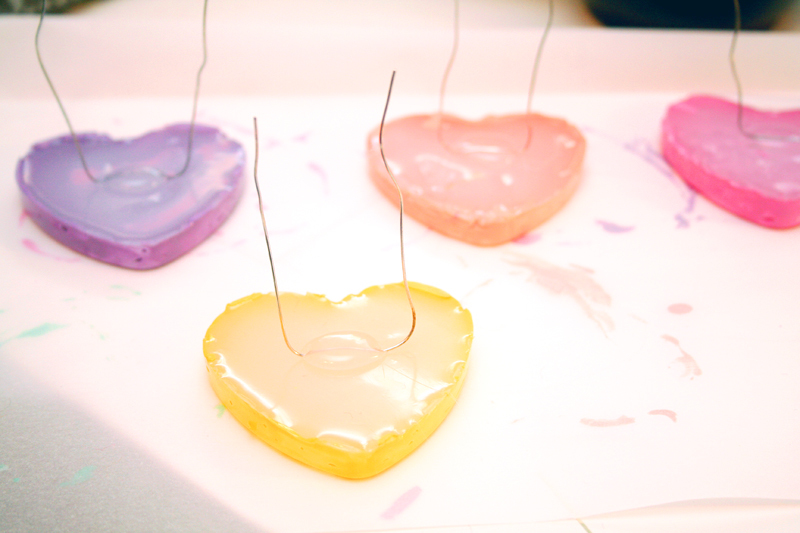 Instead of rings, I turned these hearts into ornaments by hot gluing floral wire to the backs of each. The cool thing about hot glue (heh heh heh) is that it’s pretty easy to cut through, so if I want to re-use these hearts for something else like brooches or hair clips, I can just slice off the glue blob holding the wires and glue something else there instead. I know my handwriting is terrible, but I DID MY BEST! 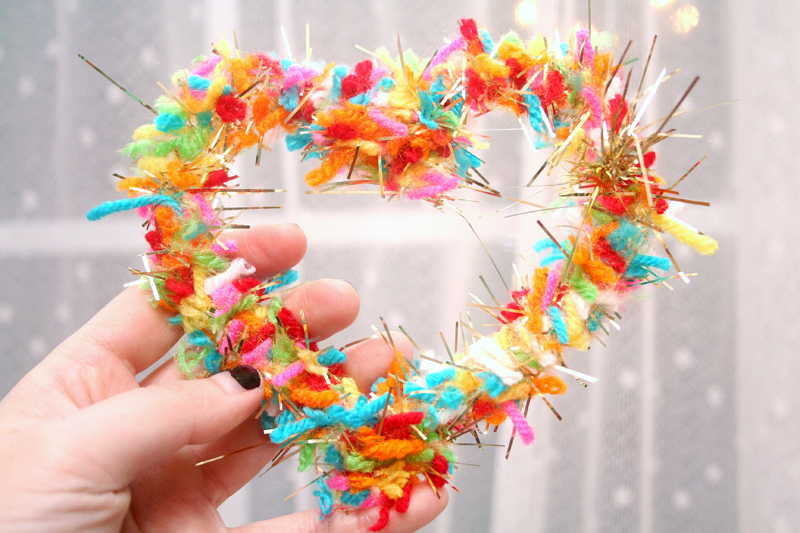 Then, I saw this tutorial from Aunt Peaches on how to use hot glue to make confetti hearts. The tissue paper I bought from Michaels to make my own confetti ended up having super muted colors from Uglytown, so I wondered if I could make YARNfetti. YES YOU CAN. AND IT’S REALLY COOL. This is a great way to use up all of your yarn scraps, so save them up and make cool shapes for decorations, gift-toppers, or, I dunno, cool headbands and stuff! 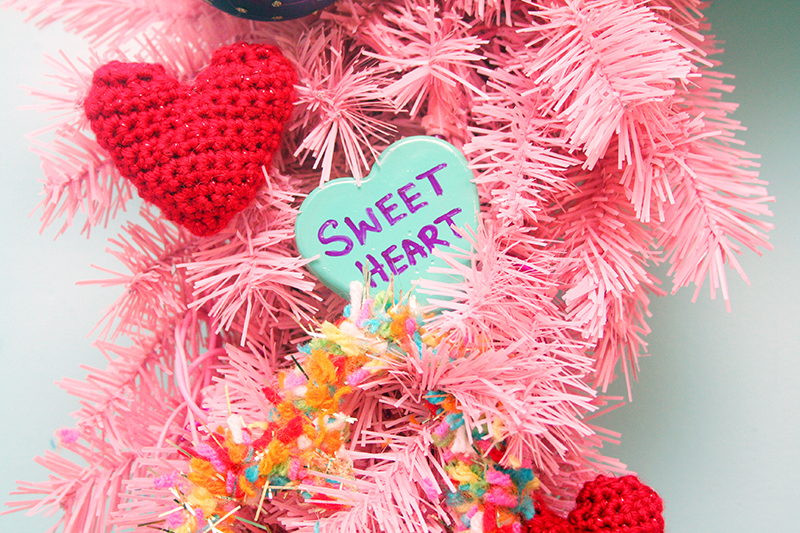 I will talk more about the yarnfetti hearts in another blog entry. 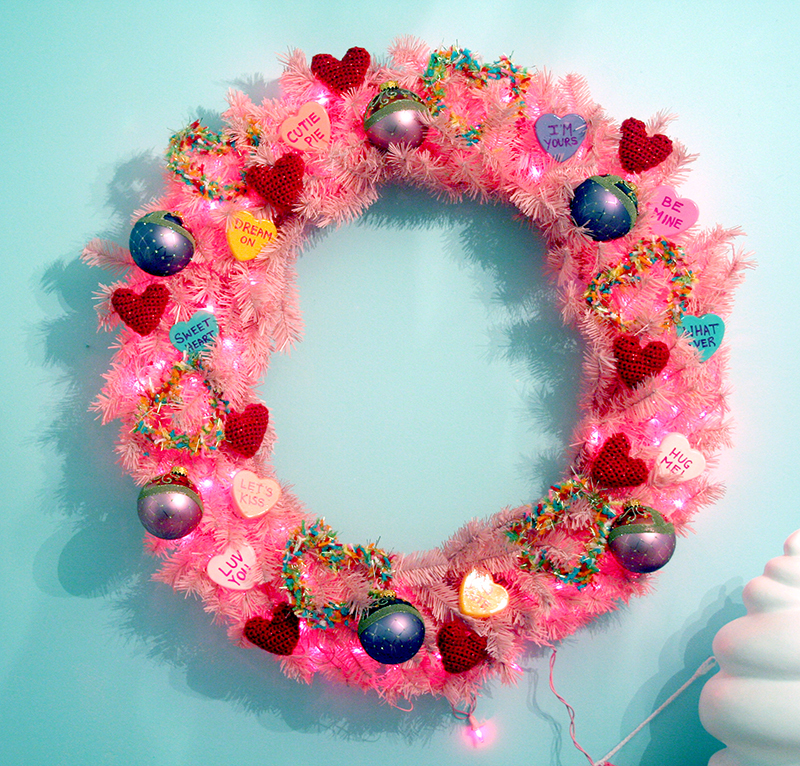 Finally, I also decorated my wreath with some puffy, sparkly, red crocheted hearts, using my own free pattern right here and adding a little stuffing. I had a lot of fun playing around and experimenting with various media. I have not used a hot glue gun this much in EONS, and I think I have 3 blisters and a sprained trigger-finger BUT IT WAS WORTH IT!!! I’m so happy with my new wreath! Good luck in the #xoTreetopia giveaway! You could win a cute set of tabletop trees and some ornaments! Enter now! You have until Sunday night! 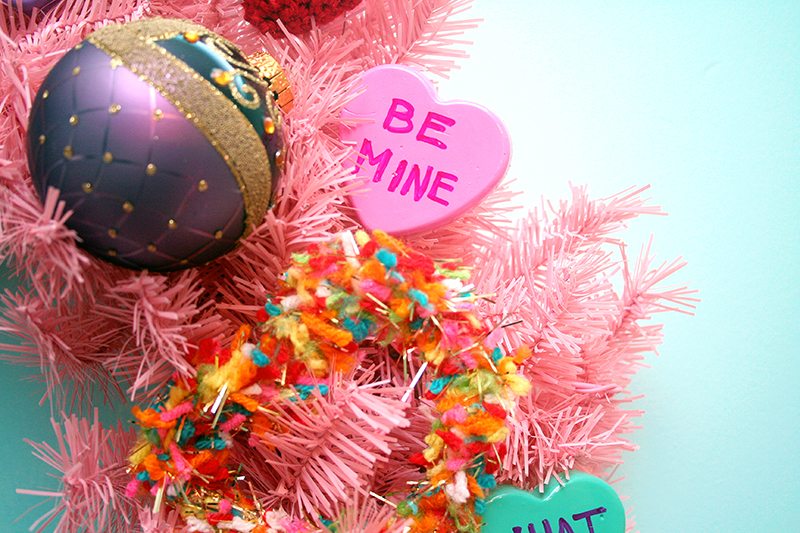 6 Responses to There’s a craft party in my Valentine’s Day wreath – and you’re invited! 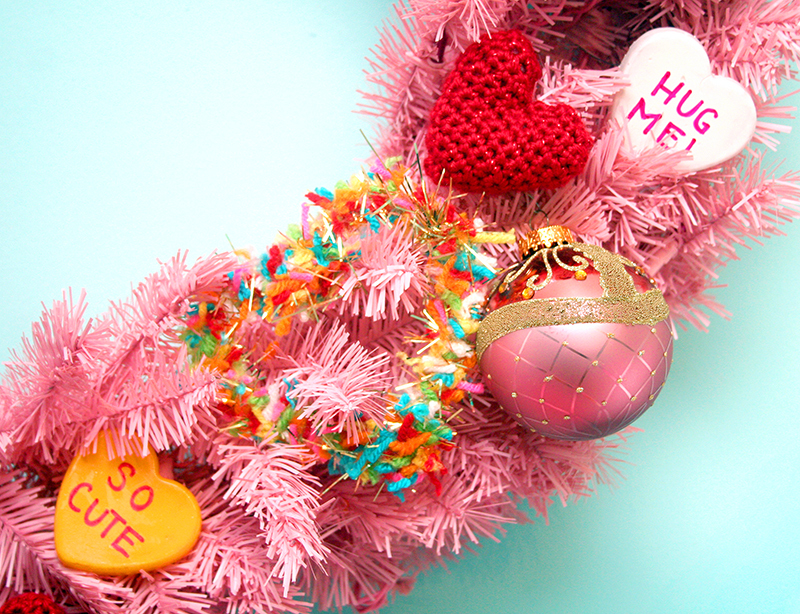 Oh my goodness, as a Valentine’s Baby, I approve of all of this hahah I love the hot glue candy hearts. I have to make some for myself! I hope you can find a smaller sized mold than mine… mine took forever to fill!! That’s such a cute wreath!! And I also love that TV pillow! Thanks!! My friend made the pillow!